Looking for a delicious appetizer to add to your Game Day lineup? 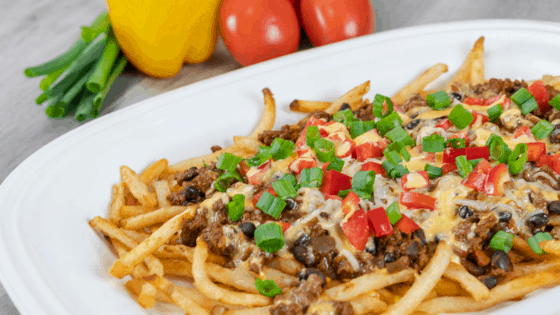 Try these Loaded Chili Cheese Fries – they’re delicious! I like to be prepared for Game Day so that I can sit back, relax, watch the game with family, and enjoy some delicious football food! While at Walmart, I grab disposable plates, cups, and utensils so that I don’t have to spend a ton of time in the kitchen cleaning up after the Big Game. I also get ready by making sure I have enough ice to pour for drinks and enough drink options for everyone! I also prepare by planning for quick, easy, and delicious appetizers for the Big Game. This year, I’ll be serving up chips, dips, and other easy to put together snacks. I’ll also be making loaded chili cheese fries using McCain Craft Beer Battered Thin Cut Fries for this recipe. McCain has a lot of different varieties to choose from including seasoned curly fries and extra crispy crinkle fries. You can find these delicious fries in the frozen food section of your Wal-Mart store! This appetizer is incredibly yummy and cheesy! By using thin cut fries for this recipe, it gives a nice crunch to your bite. The beer battered flavor adds a new element of flavor to a classic appetizer favorite for parties. Between the beer battered flavors, the homemade chili, and the delicious cheeses, it is an absolutely delicious appetizer to serve at your next party! The options are endless when preparing food for Game Day. In addition to loaded chili cheese fries, meaty sliders, crockpot meatballs, loaded nachos, and other types of fries such as curly fries, would all be great additions to your Game Day spread! Loaded Chili Cheese Fries made with french fries, homemade chili, cheddar cheese sauce, and topped with green onions, red peppers, and diced tomatoes. Prepare fries according to the package. Meanwhile, prepare the chili. In a large pot, brown the beef and drain. Add in all ingredients for the homemade chili, cover the pot, and simmer for about 20 minutes. Stirring occasionally. Heat the cheddar cheese sauce up until it is a pourable consistency. Once the fries are done, lay them evenly on a platter. Cover the fries with the homemade chili. Pour the cheddar cheese sauce over the chili and sprinkle the mozzarella on top. Spread the diced red peppers, tomatoes, and green onions evenly on top of the chili cheese fries. This is one of the best recipes that Corrie cooks tried and it turned out awesome. The chili when prepared gave out a mouthwatering aroma which increased to an unimaginable extent after baking it combined with fries. The only customization I did was to use peanut butter and feta cheese as additional toppings making the loaded chili cheese fries much richer!